Thanks to YouTube user Forksmoker, here is Aaron’s guest panel at Fan Expo Canada 2009. Thanks to YouTube user FedermanD, here are some videos of Aaron’s guest panel at Fan Expo Canada 2009. 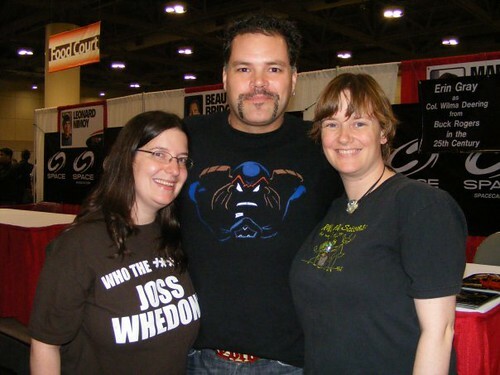 Fan Expo ’09: Aaron Douglas – Boxers or Briefs? Aaron Douglas at Fan Expo ’09 answering the perennial question: boxers or briefs? The answer may surprise you. Aaron Douglas at Fan Expo ’09 letting us know what Chief Tyrol thinks about President Laura Roslin. NOTE: This video is the same as the ‘Boxers or Briefs’ video but there’s extra video of Aaron talking (about Mary, Eddie and Paul Campbell) at the start of this one. Below is a video of Aaron being interviewed by Dork Shelf at Fan Expo Canada 2009 (August 30th, 2009). Video Description: Dork Shelf had a chance to chat with Canadian actor Aaron Douglas at FanExpo a few months ago. Douglas, best known to audiences for his work as Chief Tyrol on the acclaimed Sci-Fi series Battlestar Galactica, had just wrapped filming on the new police-drama The Bridge when we spoke with him. We talked about his new show, his work on Battlestar Galactica, what’s on his dork shelf and most importantly who he thought would win in a drunken brawl: the Chief or Colonel Tigh? Below is a video of Aaron being interviewed by Ryan from rgbFILTER at Fan Expo Canada 2009 (August 30th, 2009). Video Description: You decide. Hint: we interviewed this actor at Fan Expo last year as well. Note: I cropped yubsie out of the photo because I found her LJ entry via a google alert. Cyberpunkcomics.com booth babes Beth and Syndi pose with an incredibly nice guy and my favorite actor from Battlestar Galactica! Aaron Douglas is the great Canadian actor who played Chief Galen Tyrol. He is one of the coolest people I met at the con. Make sure to say hi to him at Dragon Con 2009 in Atlanta. Aaron was so amazingly friendly that he stopped by the Cyberpunkcomics booth at the end of the day to say hi and compliment Renzo on his t-shirt design! I wish Aaron all the best on his new show, The Bridge, where he will be playing the well-deserved lead role! I just heard from Aaron that Mary McDonnell has to go back to LA on Sunday morning. So he will be taking her autograph table and doing her BSG guest panel at Fan Expo Canada 2009 tomorrow (Sunday, August 30th). Please help spread this news to any LJ comms or message boards that you think would be interested. Guest Panel: room 716 at 3pm. Note: the con website says you need a ‘deluxe’ pass for the guest panel.